The best senior living communities in Texas serve gourmet meals in lush settings, decorate well-appointed rooms designed with seniors’ unique needs in mind, and ensure seniors of all lifestyles and activity levels always have something fun to do. Here’s what you need to know as you begin your search. Almost 90 percent of seniors say they want to “age in place,” remaining at home for as long as possible. The attachment makes sense; your home may be your most valuable possession. You might have spent most of your life there. For many seniors, however, the desire to age in place is rooted in fear of senior living, not attachment to their homes. Indeed, many seniors feel overwhelmed by the demands of home ownership and the isolation that often comes with living at home. Access to exceptional dining. 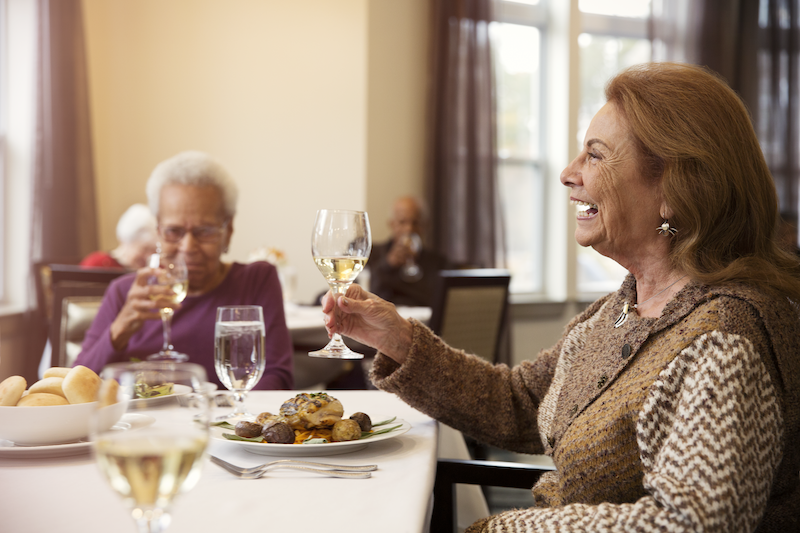 Many senior living communities offer gourmet meals and can adapt their offerings to a virtually infinite range of dietary needs. A vast array of activities and special events to look forward to. Whether you want to do yoga at sunrise, head to the local winery, or kick up your feet at a community dance, you’ll find something to do every day. A beautiful home without the pain of home maintenance. Who wants to pay for a leaky roof or endlessly deal with weeds? Senior living communities do the work for you, so you can enjoy a gorgeous home. Plenty of friendship opportunities. With other seniors just a quick walk away, you’re sure to make new friends who share your interests. And once you do, you can attend activities with them without endless logistical coordination. Help when you need it, and privacy when you don’t. A new relationship with loved ones. Many seniors worry about depending on loved ones. They don’t want to stress their children or grandchildren. Caregiving can change your relationships. Re-envision a relationship based on mutual trust instead of caregiving — that’s what senior living offers. Community involvement. Senior living communities know you don’t want to spend all your time in a single location. They plan day trips, weekend outings, and even volunteer opportunities. The chance to live life on your own terms. Choose the community that best suits your needs. Don’t depend on friends or family for transportation or support. Get the support you want in a place you love calling home. Seniors are often surprised at how affordable senior living is. After all, you no longer have to budget for unanticipated home repairs. And if you sell your home, the proceeds may even fund the costs of senior living. For help assessing whether you can afford a luxury senior living community, try our cost calculator. You feel overwhelmed by the demands of home ownership. You struggle to keep on top of household chores. You live alone and frequently feel lonely. You want to save money and reduce unexpected expenses. You worry about what would happen if you needed help because of a fall. You have trouble finding fun things to do each day. You want to be independent, but increasingly need daily help. You worry that it’s unsafe for you to live at home. Mobility issues or other impairments are making it difficult for you to enjoy retirement. You feel guilty for relying on loved ones. You want to do more fun things with your retirement than your current living situation allows. Memory and cognitive issues make it harder for you to do the things you once did. You have recently been diagnosed with dementia. You want help and support, but in an environment that fosters independence. You don’t want dementia to mean boredom or isolation. You worry about asking too much of loved ones. Once you begin touring senior living communities in Texas, you’ll get a better idea of what these communities can offer you. If you’re not sure which level of care you need, consider touring communities that offer different care levels. This will help you envision your life in each community and determine which is best equipped to meet your needs. So how can you choose the best senior living location? The answer is as unique as you are. In general, senior living communities located in or near large cities tend to offer the most. There are plenty of activities, and the central location makes them a convenient option. Houston is an excellent location for senior living. Visit the Space Center, the Houston Zoo, or the Museum of Natural Science with your family. Kingwood, a Houston suburb, offers the benefits of suburban living — quiet, easy access to restaurants, and less traffic — with all the convenience of access to a large nearby city. The Dallas-Fort Worth area is another great option. With a booming economy, high quality of life, safe communities, and plenty of jobs, it consistently ranks among the best places in the U.S. to retire. Take in a Dallas Cowboys game. Spend the day strolling the arboretum. Take the grandkids to the Dallas World Aquarium, or fine-tune your artistic sensibilities at the Dallas Museum of Art. Dallas is a hub of cultural and artistic life. Plenty of performing artists got their start here, and many more hope to follow. So consider stopping by one of its bars, where you just might see the next great musical act. Exceptional food, including a wide range of healthy options. Transportation to community events, stores, and even to doctor’s appointments. Beyond this, consider what’s most important to you in retirement. Do you want to take up a new hobby? Volunteer in your community? Make new friends? Enjoy many great books in a picturesque garden? There’s no perfect community — only the one that’s perfect for your needs. So spend some time reading up on local senior living communities. Read blogs and websites. Call around. Then schedule a visit with the most promising options. Your selection process should begin with a tour of each community. Only by seeing the communities can you really envision yourself living there. The best time to visit is during a community event, when people are likely to be out and eager to talk. So ask about coming for a meal or community social. Don’t shy away from asking residents whether they like living in the community. What do they love? What would they change? What’s their best advice for someone contemplating senior living? Is there anything they wish they had done differently? These questions might seem nosy, but seniors who love their communities will be eager to answer them. Next, tour the community with the assistance of a staff member. Ask about rooms, amenities, and daily activities. Evaluate staff as you meet them. Are these friendly people? Do they seem knowledgeable? Would you feel comfortable leaning on them when you need help? To get a second perspective, take someone you trust with you. Then spend some time comparing notes afterward. Arbor has served seniors for 30 years. Our Texas communities offer compassionate staff, gorgeous homes, tons of activities, fine dining, and so much more. We’d love to show you what makes Arbor so special. Give us a call, send us an email, or schedule a tour. We can’t wait to meet you. Click here to learn more.